hello everyone, I bought a week ago a tronsmart T428 stick. Currently the best ROM for me is (kasty-tronsmart_t428 20130529_rooted5-422) which is in this site. sync audio / video 720p and 1080p youtube, OK, ok video quality. Version of XBMC (xbmc-20130403-6200f76-Gotham_alpha2_stagefright-armeabi-V7A) navi-x streaming 720p, ok.
WIFI, Bluetooth, RJ45 (LAN), perfect, really stable. The ROM is Big fluid. For ROM (Finless 1.5 ROM): WIFI, RJ45 (LAN), 1080p and xbmc navi-x streaming 720p, unstable. no video that proves it works. (It is a fake?). I tested with my (galaxy note 2), AllShare cast connects ok with T428 tronsmart, but nothing happens. How would someone fontionne wifi display? , Tutorial, video, thank you in advance. 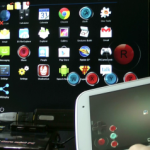 Remote display on the T428 uses Miracast protocol. Somehow, there may be incompatibilities with your phone, so far I’ve seen only only Miracast demonstrations from Nexus 4 phones. 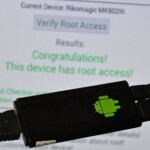 I haven’t this device but a similar device: measy u4b not rooted. You thought i can try to install it? I am not sure the hardware is exactly the same, you may end up with non working WiFI. If any troubles you can always flash back any Measy U4B firmware. I installed it and no problem until today. I can’t download an app from play store. I tried to reinstall the ROM but same problem. Do you guys have this issue? Don’t get any microphone input. Microsoft Lifecam Cinema microphone doesn’t work and neither does a Bluetooth earpiece microphone. Sound works but can’t use my voice for anything. I’m using a Microsoft Lifecam Cinema, the video works perfectly fine but the microphone doesn’t work, even the mic on my Bluetooth earpiece does not work. I’ve tried another USB hub with no success and also tried another crappy webcam but get the same result, picture but no audio. I had all this working on the previous version, barely but now it seems to have gotten worse. Seems like all microphone related things are broken. copy on sd card and install from recovery? No, you need to use Rockchip Batch Tool.